The legendary Russian writer and dramatist Boris Vasilyev, author of “The Dawns Here Are Quiet” (a novel that has been made into a play, a film and a Chinese TV series), “Do Not Shoot at White Swans” and “It Was War Tomorrow,” has died at the age of 88. In 1954, thirty-year-old engineer Capt. Boris Vasilyev left the army to become a writer. He had a whole war behind him: he had volunteered for service at the age of 17, been seriously wounded, studied at an armored warfare academy and worked as a tank tester. This solid life experience would help Vasilyev in his literary career — especially since he started it with his play “Tank Troops,” which was almost autobiographical. Yet this was not to be the first of his works to see the light of day. Renamed “Officers,” his play “Tank Troops” was banned after two performances and not published in Theatre magazine. The young dramatist’s new plays were only performed in military command theatres; he wrote screenplays for films that did not become landmarks of Soviet cinematography, while he did other work on the side — writing newsreel stories and jokes for the TV show “KVN” (Russian initials for the full title, “Club of the Happy and Inventive”). “Vasilyev belonged to a generation of writers who rethought the role of war writing in Russian literature and in people’s consciousness. This trend was called ‘lieutenant’s prose’ and included Vasil Bykov, Yury Bondarev, Konstantin Vorobyov and other authors,” says Dmitry Bak, a professor at the Russian State University for the Humanities and director of the State Literary Museum. “Thanks to them, the war was seen in a new light: not just as a feat of the Soviet people, not just an event of global scale and significance. “These works depicted the Great Patriotic War from the point of view of people right at the center of events — with the soldiers in their trenches [and] the people who took responsibility for the lives of these soldiers. In the works of the ‘lieutenants,’ combat actions of only local significance take on a universal scale when they feature the lives of people,” says Bak. The story was filmed by Stanislav Rostotsky just three years later; it was also successfully staged at the Taganka Theatre in a Yury Lyubimov production and made into the subject of an opera. Both the book and the film are ranked among the most important works about World War II. The film based on the story enjoyed huge success in China, where, in 2005, the author was involved in the creation of a 16-episode series that was watched by more than 400 million people. But Vasilyev was not just the author of one book. Vasilyev made a big name for himself as a scriptwriter. He and Kirill Rapoport wrote the screenplay for Vladimir Rogovoy’s film “Officers” — an epic tale of two commanders’ long service. Then, Vasilyev brilliantly demonstrated that he could write about more than the war: in 1973, he published the novel “Don’t Shoot at White Swans,” about forest rangers and poachers; Rodion Nakhapetov made a film of the book a few years later. In the 1980s, Vasilyev became one of the main heroes of the “era of fat literary journals” — an era that would pave the way for perestroika and whose print runs grew into millions. 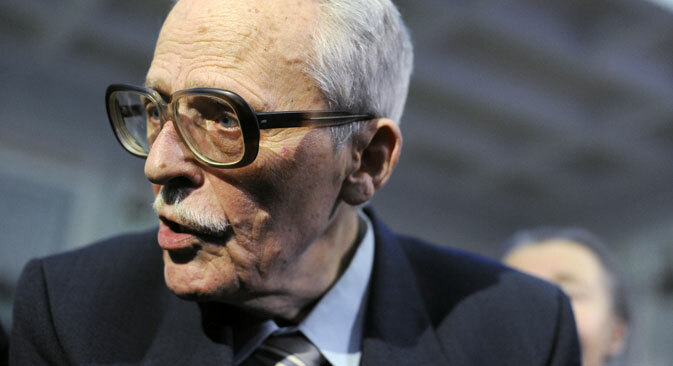 When Vasilyev entered this era, he was already a maestro: his story “It Was War Tomorrow” was published in 1984, and his short story “Who Do You Old Men Belong To?” was published two years earlier. “It Was War Tomorrow” was dramatized more than once, staged in Moscow theatres and filmed. The short story about two old men forgotten by God and by people, with their daily worries and difficulties in life, was made into one of the most celebrated films of the 1980s by Iosif Kheifits. In 1993, right after the October rebellion, Vasilyev signed the famous “Letter of Forty-Two,” in which, together with Daniil Granin, Bulat Okudzhava and other living icons, he called on President Yeltsin to ban all types of communist and nationalist ideology and propaganda. This letter put him on one side of the barricades, while others of the same generation of writers were on another side — in particular Yury Bondarev, who took an opposing stance. Vasilyev was not afraid of getting involved in history, either. He did a lot of work with historical material in the direct sense of the word: from 1996 he worked on the “Novels about Ancient Rus” series, starting with “Prophetic Oleg” and culminating in “Vladimir Monomakh,” which was published in 2010. During this period he also worked in parallel on his “History of the Oleksin Clan” cycle.